I have worn earplugs for a few years’ worth of nights and while there was nothing major, I have had to deal with a few side effects. The most prominent one was ear pain—mainly when I had gotten earplugs that weren’t a good fit for my ears or when I hadn’t inserted them properly. They work really well at blocking out noise at night and helping me and others sleep. When properly fitted, earplugs are a great hearing protector. This post not only details common side effects of using earplugs, but also how to overcome them. How deep should you insert foam earplugs? Can you insert them too deep? How to remove your earplugs? Do earplugs lead to earwax build-up / earwax impaction? Most people who give up on earplugs do so because they either cause them ear pain or just seem to be ineffective at blocking noise. So what can you do when your earplugs hurt? For me, the single most important factor that determines whether I experience pain or pleasure is the choice of earplug. If an earplug creates pressure points somewhere in the ear canal, this can get progressively worse and you may have to give all earplugs a break. So watch out for that. Stop using earplugs that hurt your ears and try a different type. I had to discard some very effective foam earplugs (and most push-in earplugs) because they started hurting either right away or at some point during the night. Many of these are rated highly by some other users. With other earplugs, I experience virtually no pressure and forget that I have them in. I have several favorites that I can wear for a whole day without any discomfort. My latest addition to these favorites is the Flents Quiet Please (NRR 29). I find them extremely comfortable. They are not the highest-rated noise blockers in my arsenal, but usually perfectly adequate for helping me sleep. 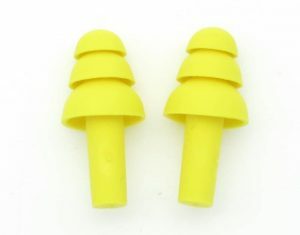 Earplugs come in many different sizes, shapes and densities; I am confident that almost everyone can find one that is comfortable and effective. Experiment and move on to a different earplug if one gives you pain. Don’t prematurely assume that earplugs don’t work for you. Don’t only consider the earplugs with the highest noise reduction rating (NRR 33). They are usually also a bit denser and exert more pressure, and may not be necessary for your purpose. For normal night-time-use, foam earplugs with an NRR of 28-29 are just fine. Now with foam earplugs there is a second point to consider: Are you inserting them correctly? 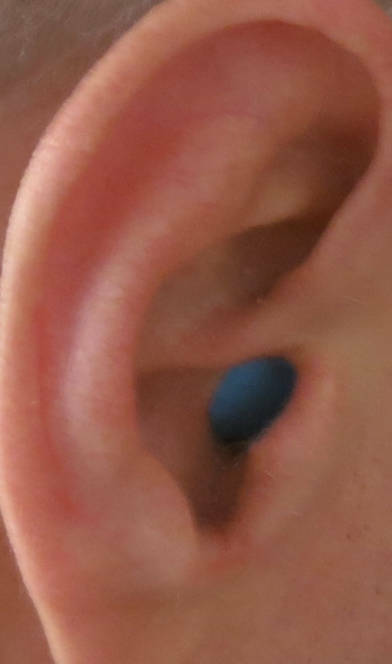 If you just push them in, or roll them up a little bit and then squash them in without pulling up your ear, they are bound to hurt and be ineffective. They need to be slender when you insert them and slide in easily. Warning: Don’t insert silicone putty or wax earplugs into the ear canal. I have written up a different section for moldable earplugs below. Roll the whole (!) plug into a tiny compressed cylinder. Slide in your earplug and hold it in place for a few seconds as you are releasing your ear. For optimal comfort and protection, earplugs really have to go in easily. You can wiggle them a bit to get them beyond a bend in your canal, but don’t try to force them in. If they can’t be inserted easily, they are likely going to cause discomfort. How about reusable push-in earplugs? Usually they have a fixed stem and a triple-flange tip. But they also come in other shapes and forms. 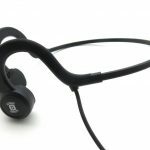 They are very useful for preventing swimmer’s ears and as a temporary hearing protector. Because they don’t have to be rolled up, they are also easier to insert. But, I find all of the ones I have tried less comfortable for sleeping than foam earplugs, so I currently don’t use them for this purpose. Because they are reusable, I have made several attempts to use them more often, but after a while they always irritate my ears. First of all, for exceptional low-frequency noise protection, you need to insert foam earplugs deeply. On the other hand, deep insertion can reduce the wearing comfort of your earplugs and may be unnecessary if you only need to take the edge of noise to allow you fall asleep. When do you need deep insertion? Studies have shown that the difference between deeply inserted and shallowly inserted earplugs can be 20 decibels and more for the lower frequencies. Note: 10 decibels additional noise-reduction is perceived as halving the loudness. By inserting your earplugs deeply, you may be able to reduce snoring noise, traffic noise, or footfalls by 20 decibels more—with the consequence that the noise is now only 25% as loud as with shallow insertion. The same applies to using earplugs for protection from hazardous noise levels. Shallowly inserted earplugs can lead to under protection, in particular if the noise is dominated by low-frequency components. So if you need maximum noise reduction, ideally insert your earplugs as deep as possible without experiencing major discomfort. You need, of course, still to be able to remove them with your fingers. I keep my thumb and index finger nails a bit longer, to allow for easy removal. In any case, if you experience discomfort, remove the plugs and insert them a bit shallower. Again reach over your head to pull up your ear. Grab the earplug with your thumb and index finger. Wiggle the plug while pulling it out slowly to break the seal. My recommendation: Don’t just jerk a deeply fitted earplug. What if you can’t remove foam earplugs with your fingers? Very occasionally, I have had to use tweezers (with blunt tips) to pull out an earplug that was inserted very deep in the ear. The last time this happened, I had just cut my finger nails cut a bit short. If this happens to you, get your partner or a coworker to help you with the tweezers. Silicone putty and wax earplugs are supposed to be rolled into a ball, placed over the ear opening, and flattened. They are designed to only cover the canal opening, not to go into the ear canal! 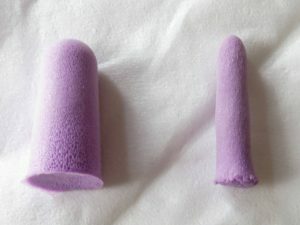 I have read comments where users mistakenly recommended rolling moldable earplugs into a cylinder/cone and inserting them into the ear canal. Don’t do that! There is a real danger that you might not get them out in one piece. Personally, I have not experienced any major issues with earwax build-up, but everyone is different. Earwax (cerumen) is a mix of different components: mainly shed skin cells (60%) and secretions produced by glands in the outer ear canal. Depending largely on ethnicity, you may have either dry wax or wet wax. Left alone, earwax slowly moves to the canal entrance and takes with it any particles that may have accumulated in the ear. It removes debris, lubricates the canal wall, prevents dry skin, and has antibacterial properties. Anything that seals the ear canal can interfere with this natural flow and may possibly lead to earwax build-up. This includes hearing aids and earplugs. I would say have your ears checked at least once by an audiologist or ENT doctor to get some recommendations that fit your situation. I recommend that you give your ears a break from earplugs and don’t wear them 24/7. 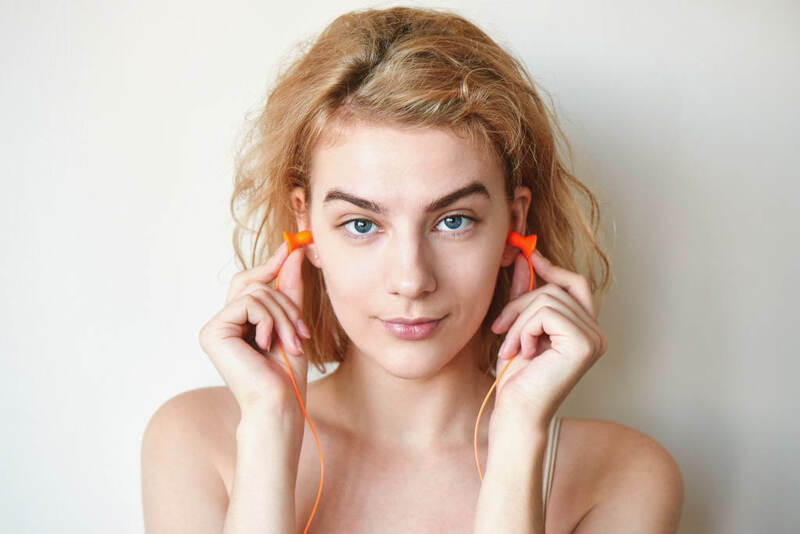 For example, if you want to wear earplugs at night, but also need hearing protection during the day, you could switch to earmuffs during the day. Or, alternatively, substitute a white noise machine for your sleep-earplugs and then use earplugs during the day when you need them for hearing protection. Or, if you need to use earplugs day and night, use foam earplugs (that go in the ear canal) when you need maximum noise reduction and silicone putty or wax earplugs when you need less attenuation. As to reusable push-in earplugs: I suspect that some of these could make earwax impaction more likely than the other types. Unlike virtually all roll-down foam earplugs (that are to be inserted without using any force and expand in the canal) and moldable silicone earplugs / wax earplugs (that only seal the canal entrance), push-in earplugs are already fairly large during insertion and so need more force and wiggling to go into the ear canal. However, I am not aware of any studies that have associated earplug type and likelihood of earwax impaction. Foam earplugs are generally disposable and single-use. If you buy a big box (100 or 200 pairs), they are also cheap, a lot cheaper than almost all supplements or medications people take on a daily basis. I must admit that I do reuse foam earplugs a few times. After each use, I put them back in a small plastic container, which I clean regularly. But still, depending on the material, they get moist, accumulate earwax and become stickier. I am confident that bacteria do grow on moist earplugs and make ear infections more likely. The recommended approach to minimize the risk of an ear infection occurring is to wash your hands before inserting earplugs and to use disposable, single-use earplugs only a single time! If you don’t want to toss them out, put them in a small earplug case after each use. Leave the lid partially open for a little while so that the earplugs can give away their moisture. Reusable earplugs should ideally be cleaned every day, but many people only put them back in their case after use and forget about them until they need them again. Often, they get taken out and put back into their case for days before being cleaned even once. If you are using reusable earplugs daily, make it a habit to clean them every night. This could become a part of your flossing and tooth-brushing ritual. Compacted ear wax can also lead to ear pain and infections so get your ears looked at by an audiologist or doctor. According to the American Academy of Familiy Physcicians, ten percent of children and thirty percent of their older patients have excessive earwax. If you usually don’t have tinnitus but suddenly experience a ringing in the ear, worse hearing in one ear than the other, ear pain, a feeling that your ear is clogged, or other changes in your hearing, it is high time to have your ears checked. The article Ear Wax Buildup & Blockage by Cleveland Clinic provides more information on earwax build-up and blockage. Earplugs are a fantastic tool for blocking out noise. I use them almost every day for about 8 hours without any major issues. Still, I try to only use them either at night or during the day and resort to other means as described above if I need additional noise reduction. Do not be discouraged if one or even several types of earplugs don’t work for you. There are so many to choose from: Try a different earplug and practice insertion. If an earplug starts hurting, remove it and reinsert it. If it remains uncomfortable after multiple attempts, get a different earplug. How to Block Out Noise When Trying to Sleep? Hi, I use custom moulded earplugs during the day and some wax ones at night. I’ve noticed that over time I do get slightly more of a buildup of wax so I have this removed probably every 4 months. It doesn’t create a problem though so I could probably not worry about that, and wait until i notice that my hearing is getting worse by excess wax. Since you already know you are prone to wax buildup, your regular checkups make sense to me. © NoisyWorld.org 2018-2019, All rights reserved.